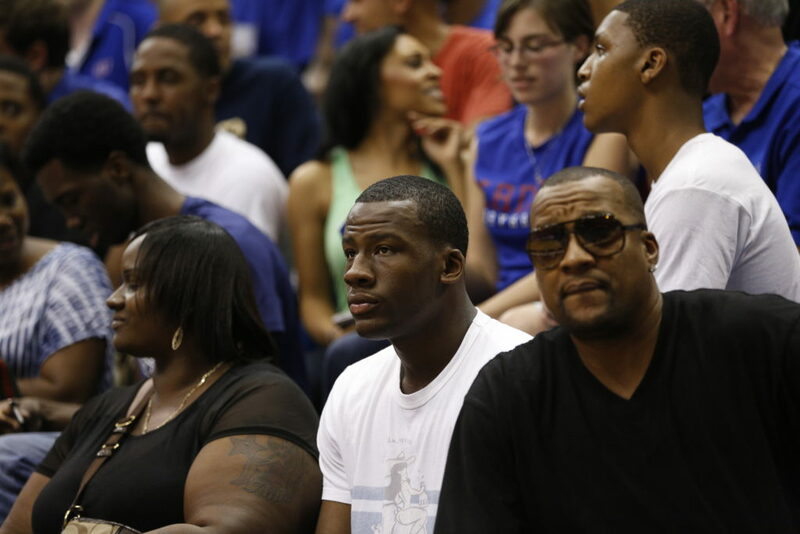 Kansas recruit Cliff Alexander watches from behind the bench during Late Night in the Phog, Friday, Oct. 4, 2013 at Allen Fieldhouse. 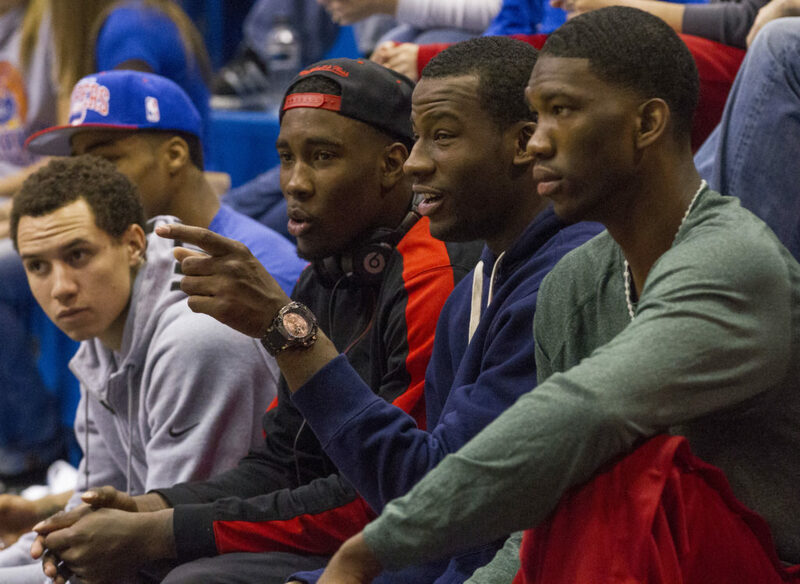 Kansas recruit Cliff Alexander, second from right, hangs out with members of the Kansas men's team Sunday afternoon at the Kansas women's season opening basketball game against Oral Roberts. Alexander's girlfriend plays for the women's team. Chicago Curie High School basketball power forward Cliff Alexander says he has been under a lot of self-imposed pressure of late, trying to choose between Kansas University, Illinois, DePaul and Memphis. “I’d been confused for the last week. One minute I want to go here. One minute I want to go there,” Alexander, the country’s No. 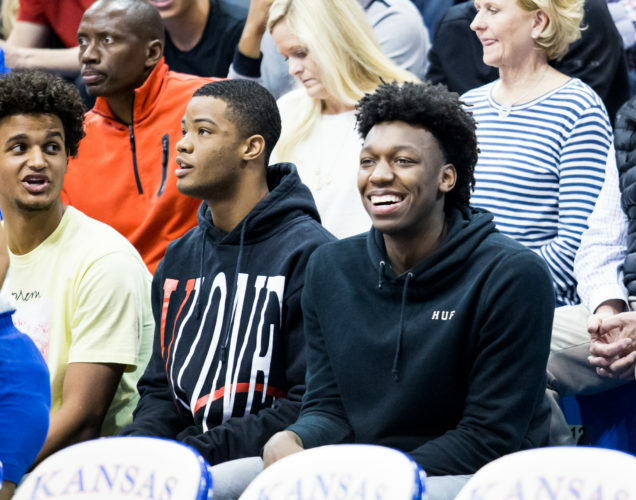 4-rated player in the recruiting Class of 2014, said Friday after announcing for KU in a controversial commitment ceremony that included hats as props, televised on ESPNU. 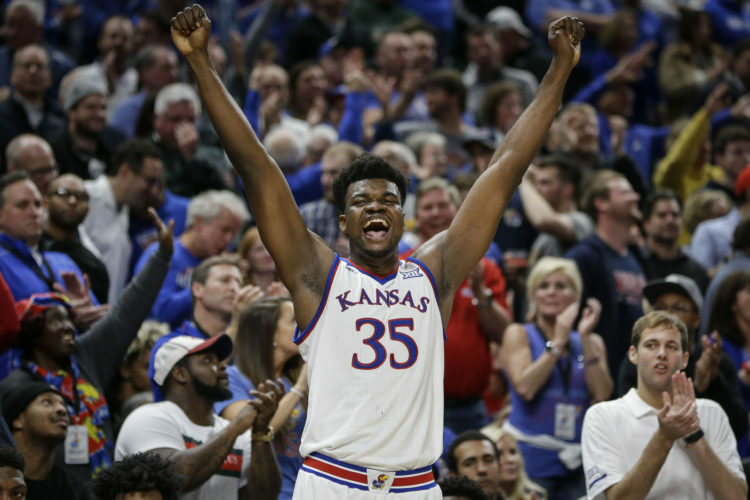 “We finally came to the conclusion last night I want to go to Kansas,” the 6-foot-8, 240-pound Alexander added, referring to family members and coaches. 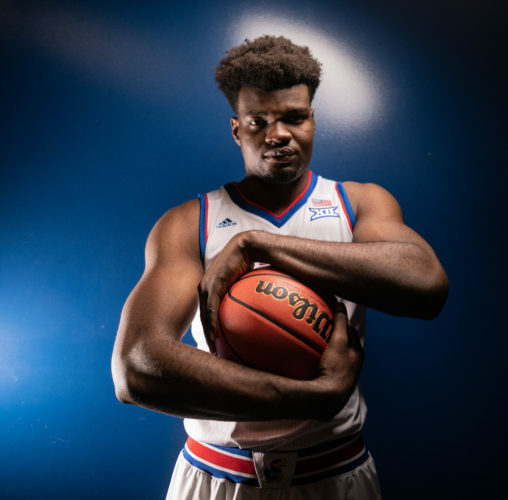 Alexander, who averaged 21.3 points and 13.0 boards his junior season, acted undecided right up until the second he told classmates in a packed Curie High auditorium he was headed to KU. Seated at a table with hats of his four finalists in front of him, he first grabbed a University of Illinois cap. He then dropped the Illini hat back on the table and placed a KU cap upon his head, signifying the Jayhawks as his college choice. The hat flap caused an immediate uproar on Twitter — Illini fans expressing their displeasure at Alexander for faking them out. “It was something my teammates thought I should do, so I did it,” Alexander said of the hat switcheroo. The league, of course, is the NBA, where Alexander wants to play in 2015-16. “One and done then come back and get my degree,” Alexander said of his future plans. Curiously, he did not sign a letter of intent Friday. The early, weeklong signing period runs through Wednesday. Pressed about the matter by a horde of media members, Alexander said, “probably January, I’m not sure when,” when asked when he’d sign. KU coach Self cannot comment about Alexander’s commitment until KU receives the letter of intent via email or fax. Alexander, who turns 18 today, said his KU commitment is “a great (birthday) present, a great present. “Coach Self is a great guy. I thought Bill Self could develop me and get me where I want to be. We have that type (of) relationship,” Alexander noted. 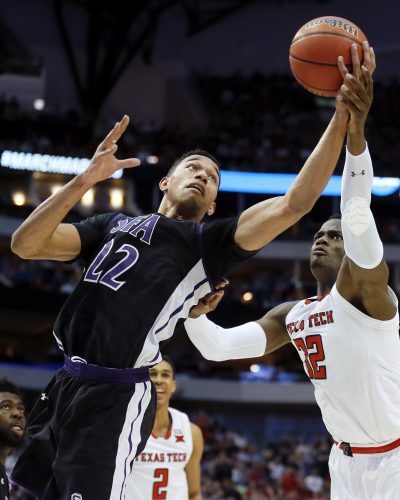 Alexander, whose girlfriend attends Kansas, acknowledged that he likely would not have chosen KU had Chicago Whitney Young High big man Jahlil Okafor chosen KU on Friday. Okafor and Minnesota point guard Tyus Jones selected Duke over runner-up KU on the same signing show on ESPNU. “I’d probably have gone to Illinois,” Alexander said, adding that he has nothing against Okafor and in fact likes him a lot. “He’s like another brother to me. We have a great relationship,” Alexander said. Alexander said he actually would like to be reunited with another buddy in Lawrence. JaQuan Lyle, who decommitted from Louisville, is considering UConn, Memphis, Louisville and others. “He’s gonna be a Jayhawk,” Alexander said, with a smile, of the player who has yet to be recruited by KU. KU has signed Kelly Oubre, 6-7 shooting guard, from Findlay Prep in Henderson, Nevada. 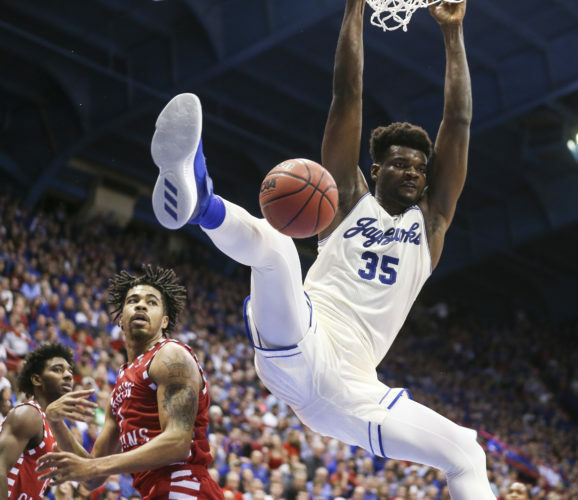 Alexander’s commitment fills KU’s current allotment of two available scholarships — those of senior Tarik Black and certain one-and-done Andrew Wiggins. KU could also lose Wayne Selden, Joel Embiid and/or Perry Ellis to the NBA, and there’s always the possibility of transfers. 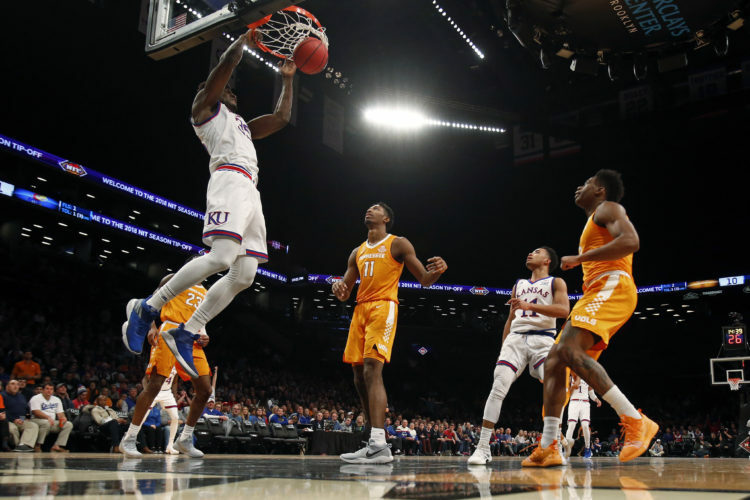 Howard key recruiter: Alexander said KU assistant Jerrance Howard, a former Illinois player, did a great job recruiting him. “He played a big role ever since he stepped foot on campus at Kansas. We’ve been talking. We built a great relationship. He was one of the guys to offer me when he was at Illinois (as assistant),” Alexander said. More on Okafor, Jones: Duke landed the country’s No. 1- and 5-rated players, according to Rivals.com, in Okafor and Jones. They were true to their word of being a package deal. “We just wanted the best opportunity to win,” Okafor said. More signings: SMU coach Larry Brown landed No. 2-ranked Emmanuel Mudiay, 6-5 point guard from Prime Prep Academy in Dallas. … No. 3 Stanley Johnson, 6-6 small forward from Mater Dei in Santa Ana, Calif., chose Arizona.